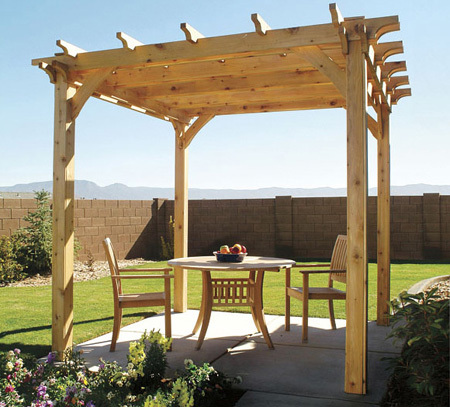 Whether you build a small arbor, or a larger pergola, this is a garden structure that will increase your enjoyment of the garden and add value to your property. 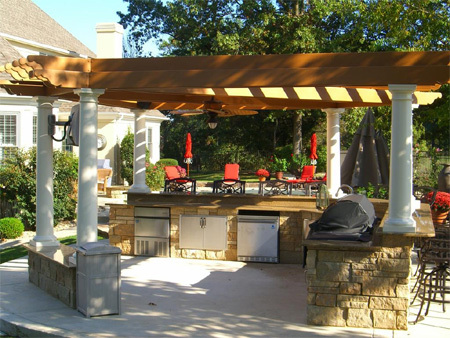 While it won't protect you from wind and rain, and it won't provide shade unless fitted with a canopy or other kind of covering, it will define an outdoor space. 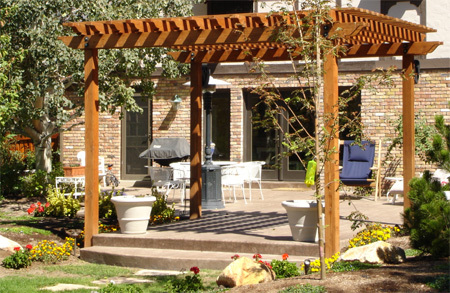 At a later stage you can add additional features to provide more protection, or plant a climber or creeper to provide shade. 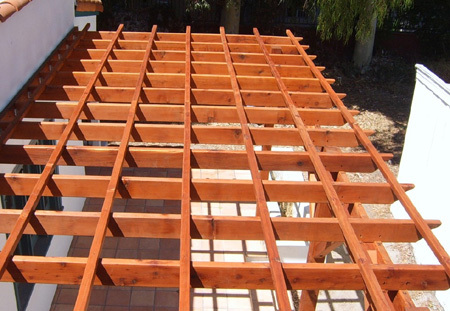 The materials used for your pergola can be pine or meranti, the former being the most affordable, or even a hardwood or exotic timber. 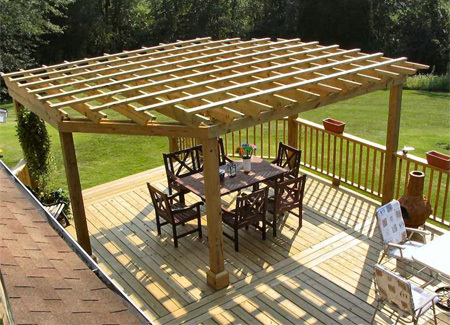 There are no measurements given for the pergola, but we do provide information on the various parts and assembly that will help you to build a pergola of any size in your garden. The most important part of the structure is the support. 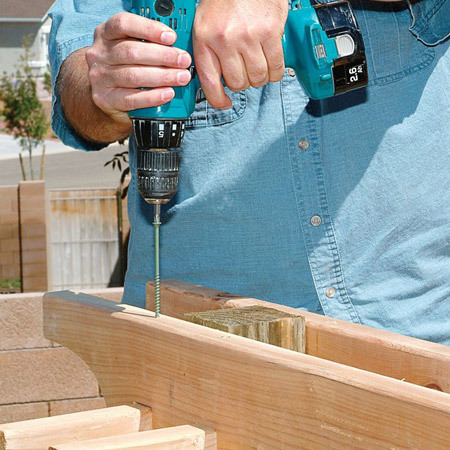 You will need 4 posts of pressure-treated lumber (pine or meranti), or brick construction. 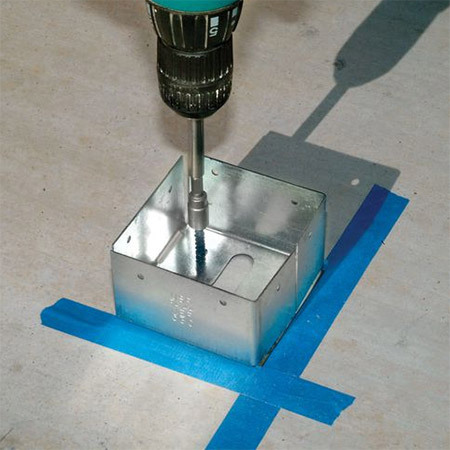 The posts need to be secured, either by digging out a 300mm wide x 600mm deep hole and setting them in concrete, or with steel base anchors onto an existing concrete foundation or slab. If using timber posts, these should be of no less than 100 x 100mm, or 100mm in diameter. With the upright posts in, the next step is to add cross beams. The cross beams are essential for holding everything together, so nothing less than a thickness of 50mm should be used for the cross beams. Mark and cut out the rafter tails on the cross beams with a jigsaw. 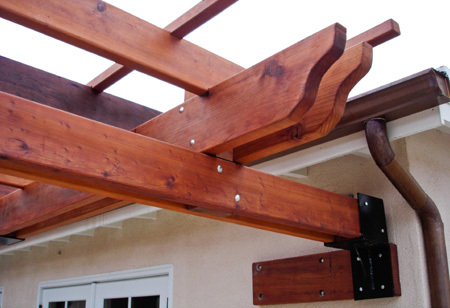 These are the decorative edges at the end of each cross beam and can add a unique design to a pergola. 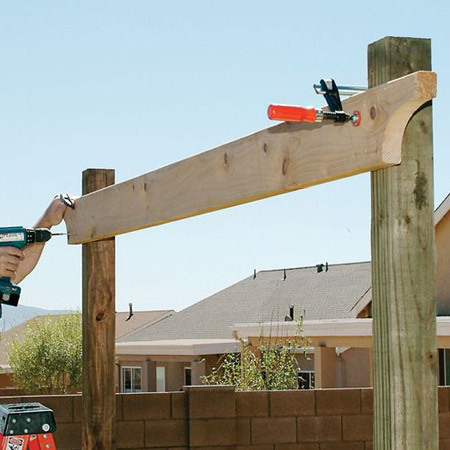 If you are using a thinner timber, double up by adding two cross beams, one on either side of each post. The next step is to fit the cross beams along the length, and these will slip over the top of the cross beams on the width. 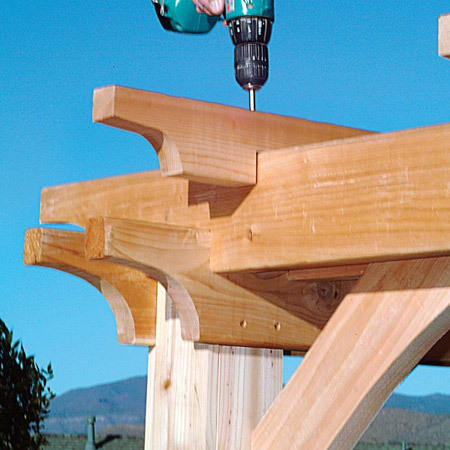 Cut out notches to the width of the timber on the cross beams along the width. 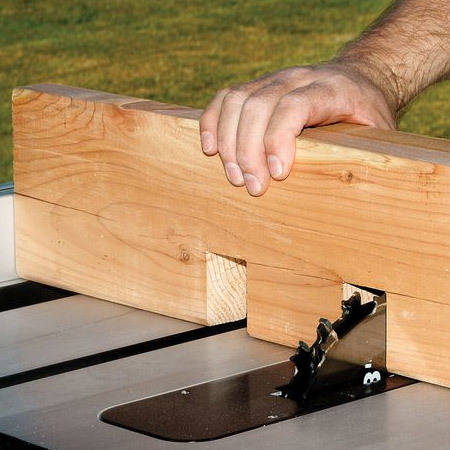 If there are two beams you will obviously cut two notches. 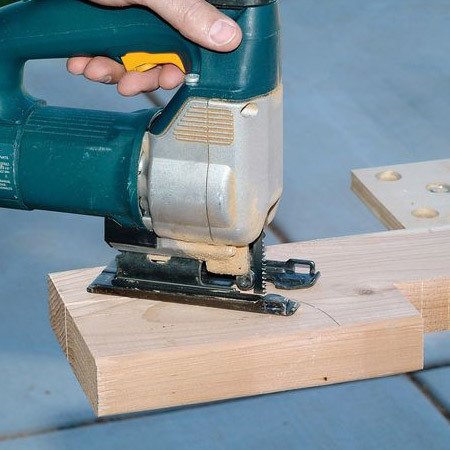 While a table saw with a dado blade is easier, you can also use a handsaw or sabre saw with the assistance of a wood chisel. 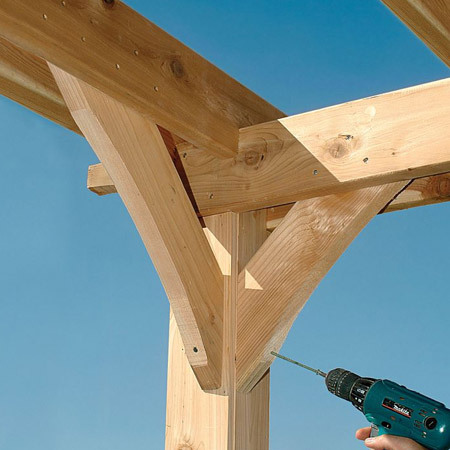 Once cut, the cross beams [length] are fitted onto the top of the cross beams [width]. 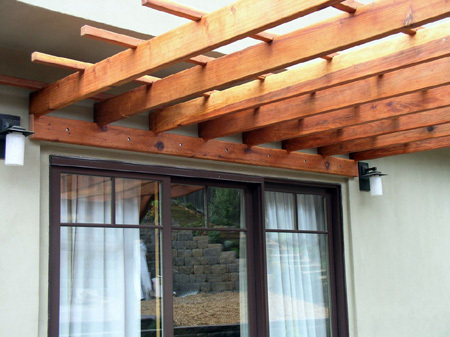 Diagonals offer additional support to both cross beams and finish the look. Both top and bottom ends of the diagonals are cut at 45-degrees. The construction is topped off with a final layer of cross beams [width]. 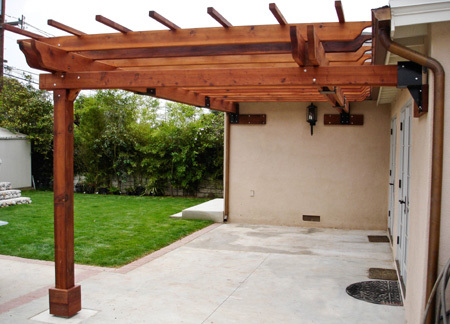 BELOW: Where a pergola is not free-standing, but to be attached to an existing wall, cut outs are created for the ends of the cross beams [length] and a beam is anchored to the wall. 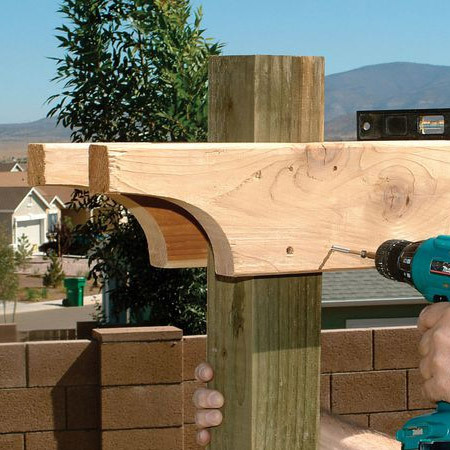 The cross beams are inserted into the cut outs and rest on the wall-mounted beam. BELOW: In this design, a beam is anchored to the existing wall and the cross beams [width] are attached to the beam using steel hangers. 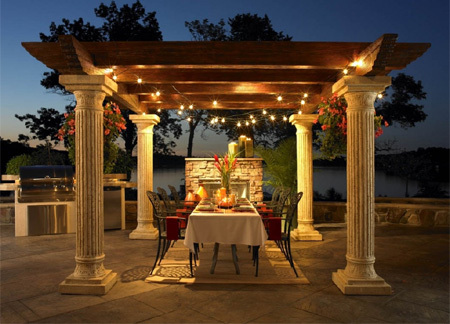 BELOW: Doric columns are the supports for this pergola, and the result is a dramatic garden feature that enhances outdoor dining and entertaining. 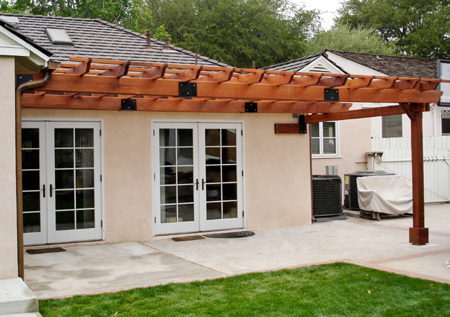 Whatever material you choose for your pergola, it needs to be sealed to provide protection from the elements. We recommend exterior sealer, with application on an annual basis.